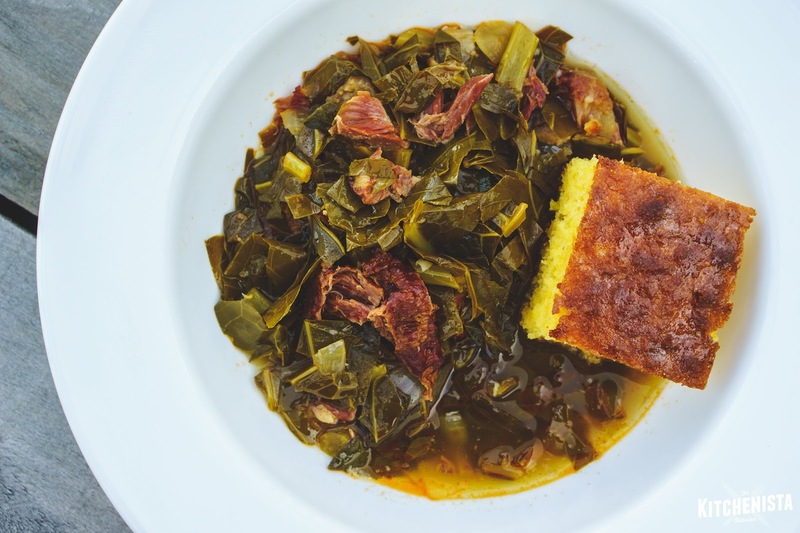 How I use my #InstantPot to make southern greens in half the time! I don't want the kind of problems that a bowl of collard greens and chunk of skillet cornbread can't fix. Greens are always on time. Unfortunately, I don't always have time to tend to the most important part of the process, which is getting that pot liquor off to a proper start. 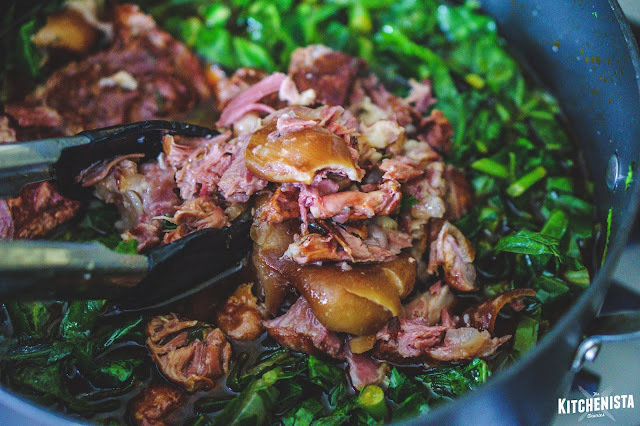 In my original recipe for southern greens, smoked pork or turkey is braised with the onions, spices, herbs and other ingredients for a couple hours until the meat is falling off the bone. Then the greens are added and everything gets happy in the pot together. Note: This post contains affiliate links. Purchasing through my Amazon links helps me to earn commissions, but does not cost you any more! A pressure cooker uses pressurized steam to cook foods in a short amount of time, and that's all the InstantPot really is. 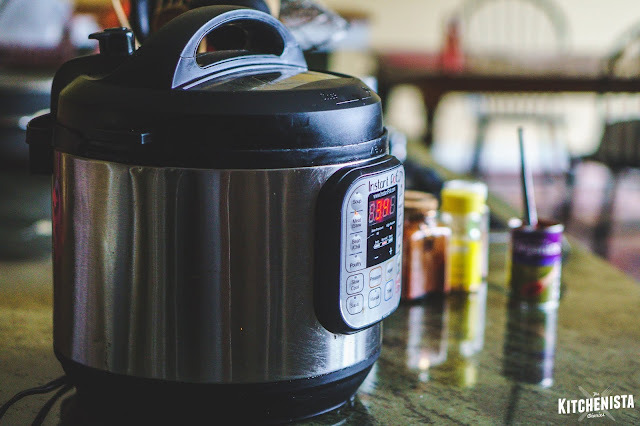 It has some built in timers and preset modes for certain types of food, but at the end of the day it's a pressure cooker, and it's the answer to cutting braising times in half - if not more. My favorite thing to use my InstantPot to cook is beans, and it does them so well they don't even need to be soaked the night before. When I was doing meal prep for clients during the week, I brought my InstantPot to work to make short ribs and oxtail in an hour (seriously!) 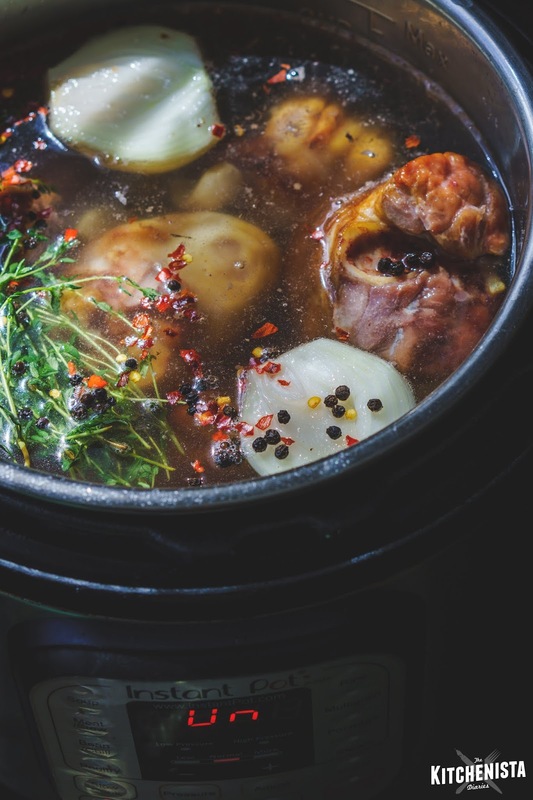 Another way I use my InstantPot is to make small batches of beef or chicken stock when I don't have time or space in the oven. Pretty much any recipe you'd make using a Dutch oven pot can be converted for a pressure cooker. 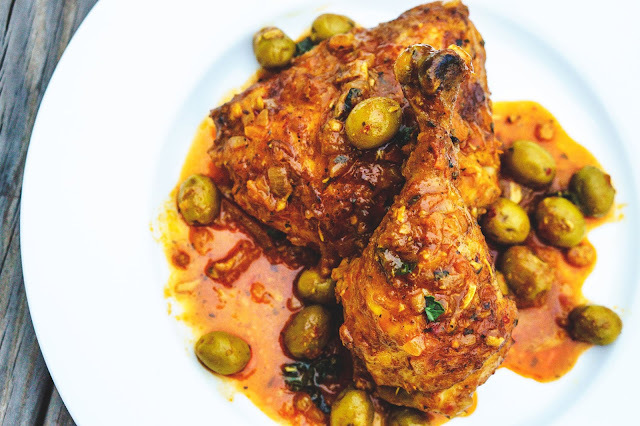 There's a little bit of finessing required to develop the same depth of flavors in the sauce, but all in all you can get some really good results considering the benefits of freeing your day up. But back to these greens. Since the first half of the recipe is the same process as making stock, I realized I could just do that step in my InstantPot . All of the good flavor from the smoked meat and aromatics gets infused into the liquid, just as if you'd simmered it on the stovetop for a couple hours. 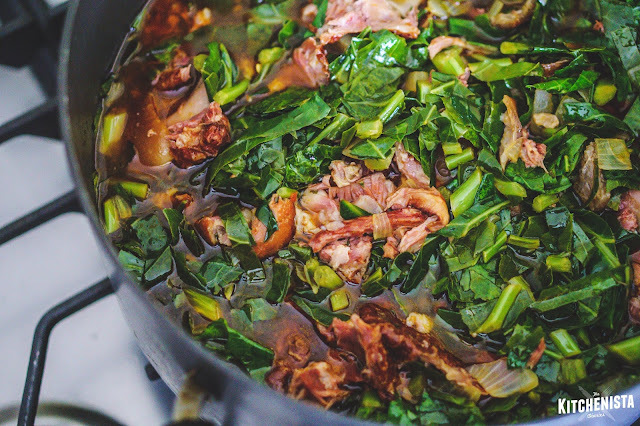 Then you just strain the liquid, reserving the cooked meat, and combine it all in a pot with chopped greens to simmer until tender. Once you have the stock done, you can even freeze a quart for the future, which takes up less space in the freezer than cooked greens. As with any pot of greens, the leftovers get better and better over a few days. 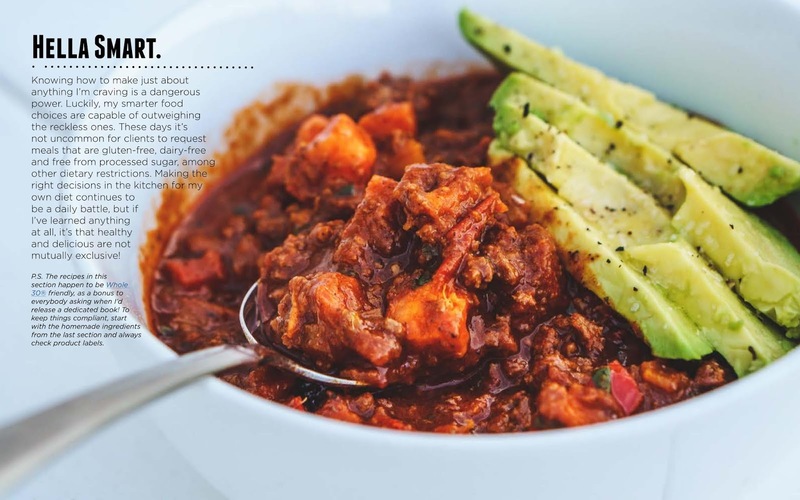 Grab the modified recipe below! *Note: You can make as little as one pound of greens at a time using this method, if you plan to freeze the rest of the stock for another batch. I won't even judge if you dumped a bag of shredded greens in, but you could certainly work with fresh greens just like the original recipe. A mix of collards, kale, mustard greens or turnip greens also works. To get started, place the smoked meat, peeled onion halves, garlic, smoked paprika and red pepper flakes into the InstantPot . Add enough water or stock to cover; at least six cups, but if you have room you can add more. (Like I mentioned above, you might as well make enough to freeze some for later.) Throw in the thyme, bay leaves, and peppercorns, then pour in two tablespoons of vinegar. Close the lid of the InstantPot . When closed properly, you'll hear it clamp and lock in place. Select the option for Meat/Stew or manually set your pressure cooker for 35 minutes on high pressure. The pot will take several minutes to heat up and build pressure before the timer starts to count down, at which point you'll know it's working. After the 35 minutes are up, the timer will go off, but there will be too much pressure to open the lid. I use the "natural release" method and let the steam release on its own gradually. 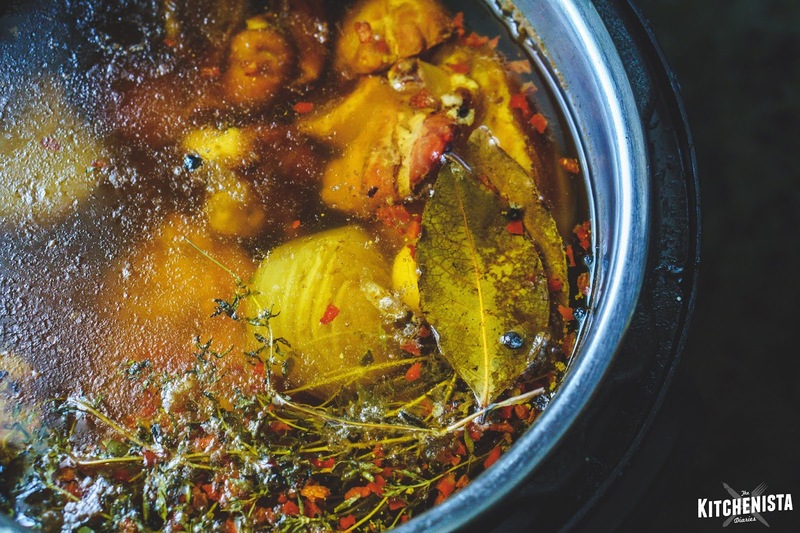 This takes another 15 to 20 minutes, and gives the stock even more time to build flavor. If you were really in a rush, you could push the vent open to manually release the pressure. Just be careful if you do that with a pot full of liquid, as the steam is very hot and tends to splatter. I carefully ladled the stock through a mesh strainer and discarded the onions, herbs, bay leaves, and peppercorns. If you happen to find the garlic just mash it into the stock. Once I was down to the big chunks of meat, I transferred them to a pan and set aside until cool enough to handle. For this particular batch, I used 4 cups of stock for 2 pounds of greens and froze the rest of my stock (and some of the meat) for a future batch of greens. Remember that the greens will give off liquid on their own, so you can always wait to see what you end up with and add more stock if really necessary. While the greens are simmering, you can pull off the bits of tender meat that should be falling off the bones. Discard the bones, fat, and tough bits of skin. Shred or chop up the meat and add it to the greens as they finish cooking. 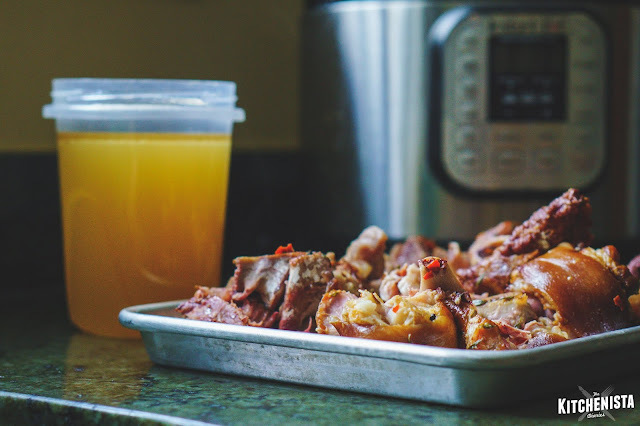 If you're freezing any stock, you should add some of the meat to your containers. To this day, my favorite kind of meat to use for greens is ham hocks. It's just so unctuous and flavorful... hard to resist! Season the cooked greens to taste with salt and pepper, and add the maple syrup if using. 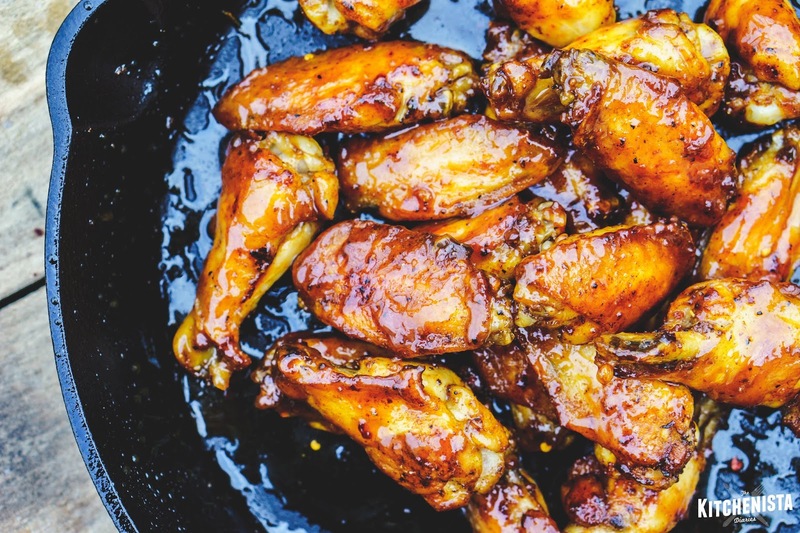 You may also want to wake things up with an extra splash or two of vinegar and hot sauce for heat. Let the greens cook for twenty minutes or so, until they're adequately tender and have absorbed all that good flavor. To finish, stir in the butter. The nice thing about this method is that you can enjoy the greens while they still have more of a bite left, which is how I like them. It was a fresher flavor, almost like a really good soup. The second day, or after additional simmering, the greens take on a softer texture and more of that dark murky coloring. The pot liquor gets better and better. So there you have it! 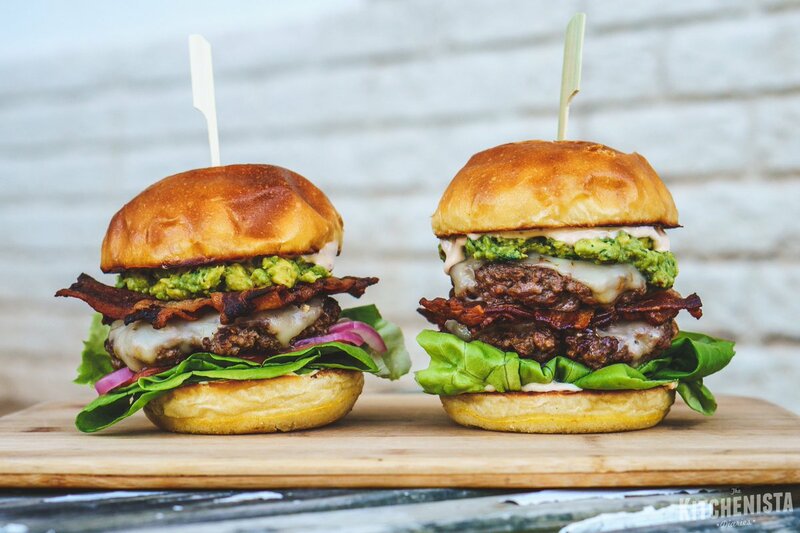 Authentic greens in half the time. 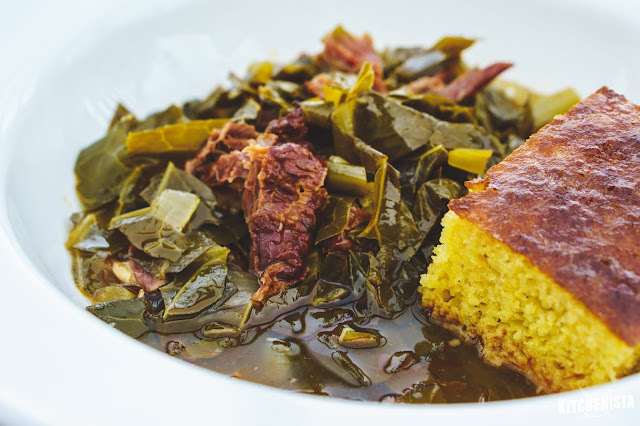 I enjoyed a bowl of reheated greens today for Sunday dinner, with cornbread of course. These days I've been using gluten-free flour, but my skillet cornbread recipe cooks up just the same! When I decided to start a food blog, I’d never picked up a real camera or written a formal recipe before. At the time, I was working fifty to sixty hour weeks as a construction accountant and living check to check as a single mom. My resources were pretty limited. I blogged from a two-bedroom apartment in South Florida with nothing more than my cell phone and company-issued laptop. The only food I could afford to use for content was our actual groceries. When I wanted to learn something new, I relied on Google. When I needed to invest in better equipment, I gave up the things in my budget that weren’t as important to me. When it seemed like there were never enough hours in the day, I made the time in the middle of the night. 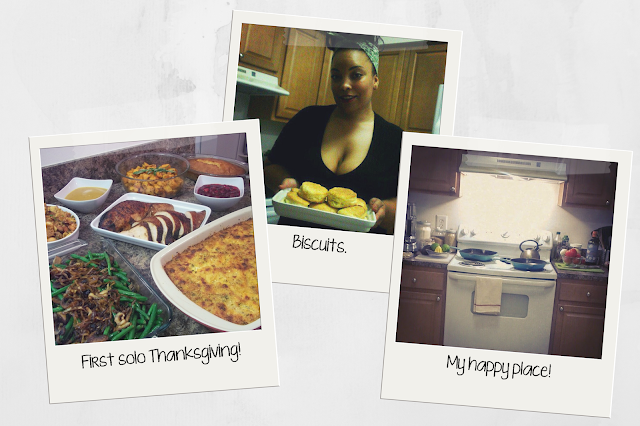 I was on a mission to become a better home cook, and those sacrifices were worth the renewed sense of fulfillment. The hustle was just as addictive as the creative process. 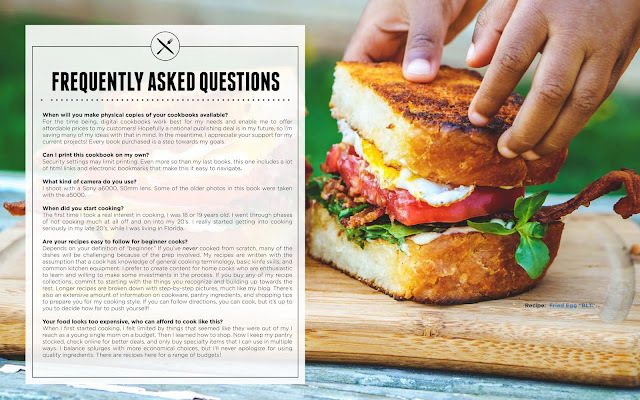 Since 2012, I’ve self-published four digital cookbooks, developed partnerships with national brands, worked as a personal chef, hosted ticketed dinner events, published hundreds of original recipes and connected with thousands of new people. During that time, I also had a baby, moved back home to Virginia, and left my accounting career to embrace this freelance life full time. It’s been a crazy six years! Making the leap from an accounting career to freelancing was pretty damn terrifying. It’s been a challenge to figure out how to build consistent income streams while balancing my time for recipe development, writing, creating online content, and managing daily social media engagement! Just when one thing seems to work, something else falls behind, and that juggling act makes for a pretty unstable life. While I've been really successful in establishing myself as a respected brand, I’m definitely not where I want to be financially. Part of my soul searching process over the last few months has involved thinking about what’s working, what’s not, and what will ultimately make me happy...and be consistently profitable. 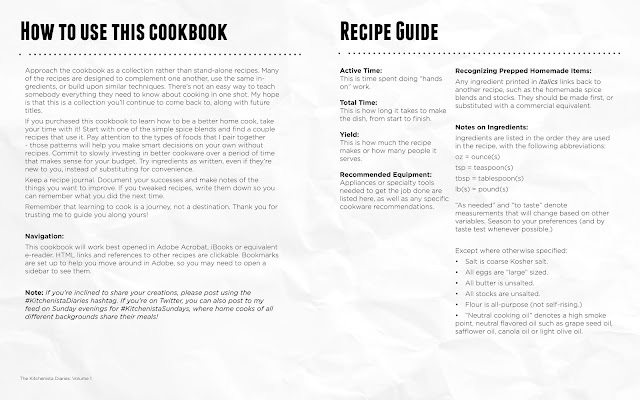 My work as a personal chef stuck out like a sore thumb from my digital brand as The Kitchenista Diaries. 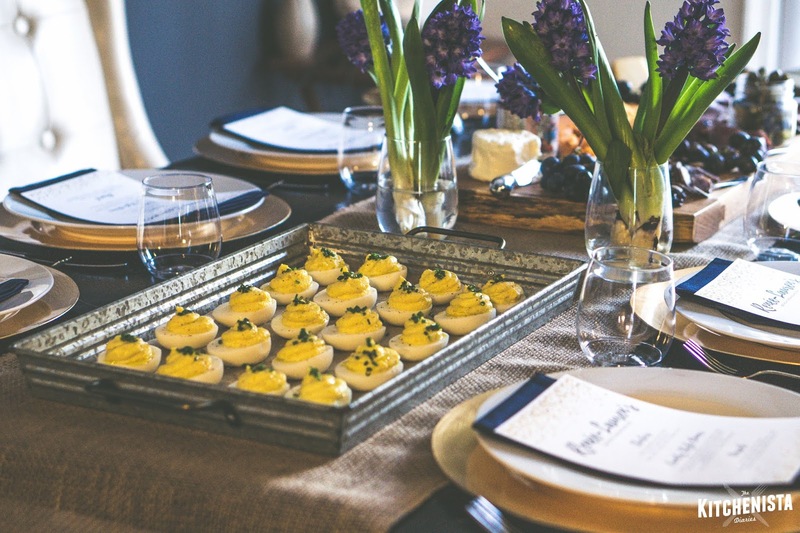 It’s been the most difficult part of my business to get off the ground, and a lot of that is because I wasn’t putting in the time to properly market my services, streamline the pricing process, or sort out realistic catering menus. The types of jobs I was able to take on without renting commercial kitchen space were pretty limited, and working by myself in private homes started to feel like a safety risk I wasn’t willing to take with new clients. I’m not closing the door on catering opportunities forever, but treating that part of my business like a side gig was not putting me in position for success. If I extract what I did enjoy about the work, it is planning dinner party menus, tablescapes and fun experiences. So I’m going to take that piece with me, make space for entertaining in my personal life with friends and family, and see what kind of ideas for online content comes out of it. It’ll give me a necessary creative outlet without the added pressure of trying to make it a viable income stream right now. 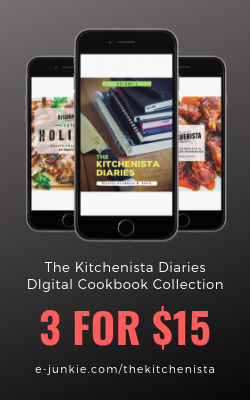 I accomplished what I set out to do when I created The Kitchenista Diaries. I’m a better cook today than I was six years ago. I’ve learned how to photograph, write, and share the dishes that I love in a way that has inspired and motivated other people to cook more at home. It’s an awesome feeling, and I’m really proud to have persevered when the journey got rough. I’ll always be looking out for the next dish to master, ways to improve my camera skills, and keep working on polishing my writing. But now it’s time for me to dream bigger and set some new goals for my brand, business, and personal life. Landing a publishing deal is at the top of that list, along with launching an online store, getting my health under control, and moving back into my own place. Will any of those things be easy? Nope. Has that ever stopped me before? Nope! I know that the same hustle, drive and intuition will carry me forward like it did when I learned how to cook, but the difference is in needing a more disciplined approach, and realizing that I don’t have to do it all on my own anymore. Over the next few months, you’ll be seeing some changes here on the site and on my social media channels. The first big change is a website redesign! I’ve been publishing on Blogger’s platform since day one, but quickly outgrew it. If you’ve ever had to invest in a professional website, you probably know the kind of sticker shock that involves. I’m happy to say that I earned enough this year from ebook sales to finally put some money aside, so thank you to everybody who continues to support those projects! The new site will give me the ability to better manage online sales, so you’ll be able to purchase digital cookbooks here instead of on a separate site. 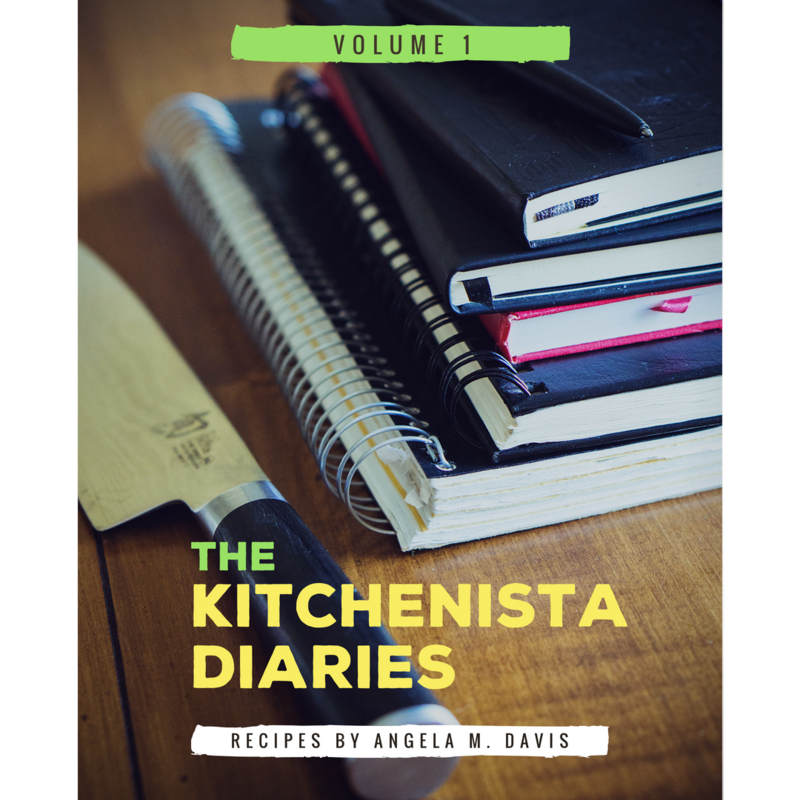 Along with that, some official Kitchenista Diaries gear is on its way, and custom designed products like aprons and recipe journals. I can’t give away all the other surprises now, but I will say that moving in a new direction will open up so many more possibilities for my brand and make it a sustainable business. That’s really important to me, because The Kitchenista Diaries isn’t just a blog to me - it’s my career in real life, and I have to treat it that way. As far as the site itself goes, I’ll be opening up my platform to share the stories of other home cooks who are embarking on journeys of their own. This means there will be lots of opportunities coming soon for other food bloggers interested in guest posting, cross-posting, and freelance food writing submissions. I’m also actively looking for illustrators who are taking on commissioned work. When the new site is up, there will be a place for you to check for all of those opportunities as they become available. I’ve faced a lot of curveballs and obstacles along my journey as The Kitchenista, but my passion for home cooked food remained the constant. I’m sure my new adventure will be just as life-changing, and probably even more treacherous, but I'll deal with those hurdles as they come. I’m moving forward into this new chapter the only way I know how: One recipe at a time. The past couple of weeks have been a whirlwind! My newest digital cookbook is officially out, and I'm so grateful for the initial support! 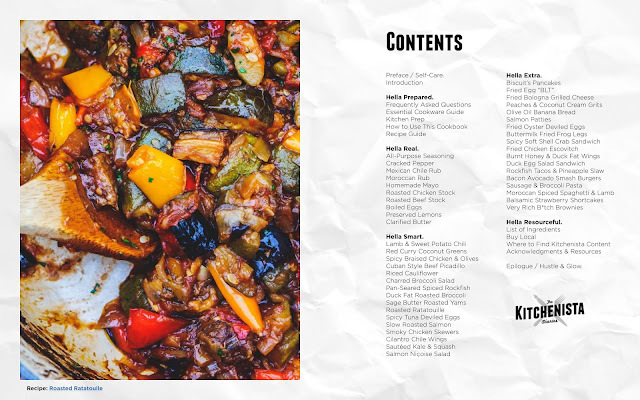 In this collection you'll find more than forty fun recipes ranging from healthy Whole30 compliant dinners all the way to guilty pleasures. 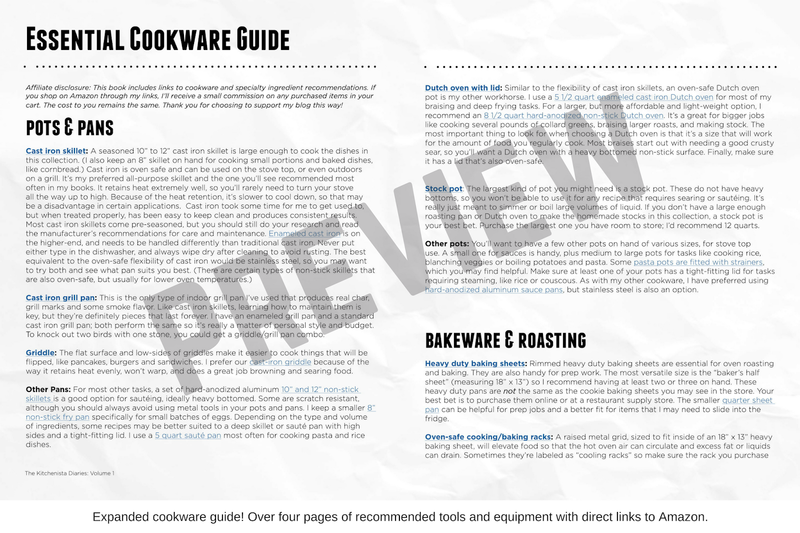 I've included a ton of tips that helped me become the home cook that I am today, and expanded my cookware shopping guide, complete with convenient links directly to products you can purchase on Amazon. Like my prior cookbooks, I've organized the recipes so that things like homemade spice blends and condiments are used throughout the collection. Many of the recipes compliment each other, as well as those from my prior books, so you should have no problem at all putting together meals and even dinner parties with shared prep steps! As a bonus, I've curated two #KitchenistaMix music playlists that were inspired by the making of this cookbook! They're available on iTunes, Google Play and Spotify. Music is a huge part of my kitchen experience so I'm really excited to add more playlists in the future! I can't thank you enough for your support with this project. 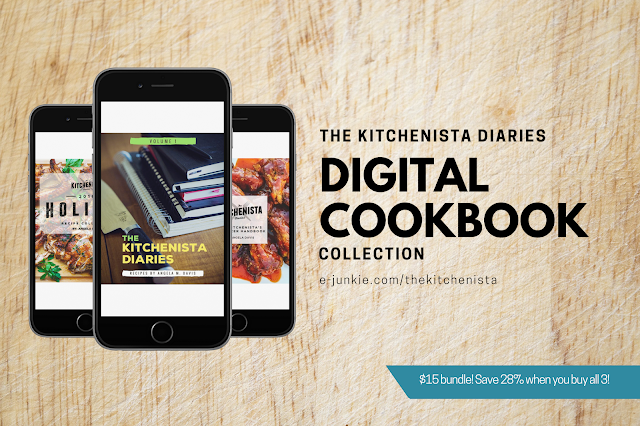 Ebooks have been the main source of income that I use to offset the costs of running The Kitchenista Diaries and help to fund my new business endeavors. One of the major projects I'm undertaking this summer is a site redesign in order to move to a platform that better serves my growing readership and business needs. I'll finally have the ability to integrate e-commerce, which means merchandise is on the horizon, as well as easier ways to check my availability and pricing for basic catering packages. So again, your support is appreciated and the very reason I'm able to continue growing this community and business! Read on below for a preview of The Kitchenista Diaries: Volume 1, including the Preface, in which I shared some of my challenges over the last year and how I turned to the kitchen for some much needed self-care. Sitting here in the final hours before pushing out a new cookbook, I can’t help but think of the last time I sat in front of my laptop doing the same. It was November 2016, and I’d just quit my accounting job in the weeks prior. Had the book tanked, there was no Plan B. I had no real idea what the future held when I walked out of that office for the last time, but I knew that to move forward I had to leave behind what was no longer serving my purpose. Sure enough, my plate immediately became full with opportunities I wouldn’t have been able to take had I stayed at my desk that day. 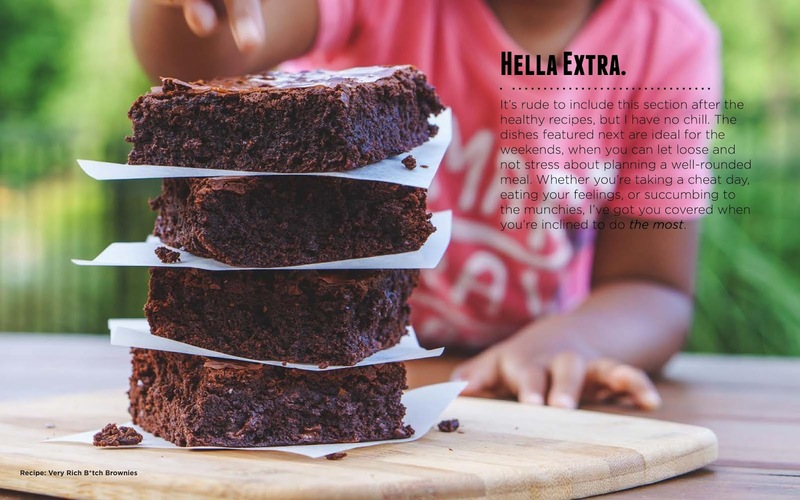 I spent most of 2017 cooking for private clients, pursuing freelance recipe development, and creating content for other brands. 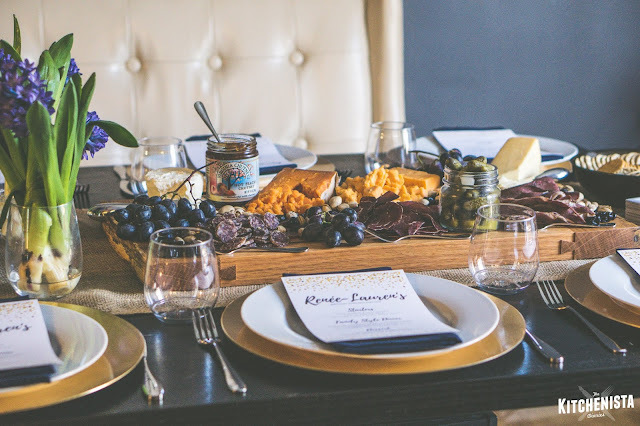 This past fall, I hosted a series of ticketed dinners inspired by the #KitchenistaSundays hashtag. It was my first experience cooking in a commercial kitchen and managing an event staff. At the Friendsgiving celebration, we fed over a hundred guests in one sitting. It was a surreal night. Six years after my first blog post, my passion for cooking had catapulted me beyond anything I’d originally ever dreamed. But as the Kitchenista brand blossomed online, I was privately struggling in my personal life. With the craziness of the fall season behind me, I was excited to get back to my usual routine. Or so I thought. If it wasn’t financial setbacks from bad business deals or broken laptops, it was the early sunsets cutting my workable hours short and a creative block interrupting my grind. Having coped with bipolar disorder for more than a decade, I’m no stranger to recognizing the signs of burnout. But somehow I missed it this time, chalking it up to holiday exhaustion. Things went from bad to worse, and trauma I hadn’t thought about in nineteen years resurfaced as if it had just occurred. Every day, I’d stare at my computer screen for hours, to no avail. By the time winter was in full swing, depression had swallowed me whole. For the first time since pursuing this career, I was too tired and emotionally depleted to work effectively. Bouts of crippling back pain started taking me out for days at a time. Panic attacks followed, one so bad that I spent an afternoon in the ER shortly before my 36th birthday. The pressure to keep a presence online through all of this was unbearable at times, but the last thing I could afford to do was risk the little bit of work I still had. Truthfully, there were nights that I was ready to give this all up entirely. I’d worked through all kinds of adversity in my past, but the depths of this struggle have blindsided me at times. Building a business has been the hardest thing I’ve ever attempted. It often feels like I’m crawling towards my goals, unable to come up with the means to rent kitchen space or hire administrative help, or any of the other things that would push my business forward. Cooking turned out to be the easiest part of the journey. Imposter syndrome is real, and there are days that no amount of accolades can convince me I know what the hell I’m doing. I’d grown weary of the running starts and abrupt crashes and burns that have come along with my choice to take this path. I don’t miss accounting, but I crave the stability of direct deposit on Fridays, healthcare, and the independence of having my own apartment. Bigger influencer opportunities and the prospect of a national publishing deal have been dangled in front of me, the latter of which I made steps to pursue, but these are still unknowns and not anything to plan a future around. All of my attempts to get a new digital cookbook started were fruitless. I decided to free myself from the pressure of a self-imposed publishing deadline, resigning not to spend additional time on something I didn’t love. It suddenly became evident that I had more to let go. I halted my plans to organize new events and cut back on the types of catering jobs I was willing to price. I turned down sponsored blog work that didn’t feel true to my brand. If dinner wasn’t ready before the sun went down, I didn’t worry about taking a photo and as a result, enjoyed hot meals for a change. On days my patience was short, I tried my best to employ the block and mute button instead of losing my cool as I’d often done in the past. I stopped picking up the phone when I wasn’t up to being social. Hibernation followed. I meditated at night with YouTube guided hypnosis sessions. I binged both seasons of Insecure, twice. I listened to my old cd mixes, a lot of Jean Grae. Oprah took me to church on Super Soul Sundays podcasts. I didn’t feel guilty for the time I needed to take to myself to get through that darkness. Whatever wasn’t absolutely necessary for my survival fell to the wayside. In the first of only two times that I left my house for more than groceries, I escaped to Wakanda. A month later, I spent a few days in DC with Ozoz, a fellow blogger visiting from Nigeria. We had an amazing time sightseeing with our kids during the day and enjoying restaurants at night. In the presence of another black woman in the food industry who fully understood the struggle, I felt seen. During periods in my life that I felt lost, cooking has helped me to find myself again. So as I’ve often done in the past when too numb to do anything else, I reclaimed my time in the kitchen. I cooked for pleasure in a way that I hadn’t been able to do in nearly a year. I spent my days testing new recipes and finding my groove again with the blog. Revisiting some of the struggle meals of my past, I made the most of a dwindling grocery budget. My cravings fluctuate between the healthy foods I feel smart for eating, and the not-so-healthy foods that I indulge in more than I’d like to admit. Quick skillet meals, decked out sandwiches and tacos provide temporary joy, but it is the complicated projects that distract me from my thoughts. I make pasta when I’m anxious. Preparing it from scratch means fifteen minutes of uninterrupted bliss, my troubles disappearing into the rhythm of kneading dough. The repetitive motion of running stretched pasta sheets through the roller is almost as satisfying as swirling fresh noodles into an unctuous meat sauce and a blizzard of fresh grated parm. Elaborate lasagnas are my specialty. Those take me all day to prepare, sometimes two, and the first bites never fail to leave me speechless for a moment. The longer a recipe takes to cook, the more apt I am to be lured in by the prospect of forgetting all that ails me while I dice, chop, grate, mash, and tend to bubbling pots. As my favorite music plays in the background and the day’s final rays of sunlight stretch across counters, I am at peace. In early January, before I had any idea what was about to unravel, Britt Stephens interviewed me for POPSUGAR for a black history month feature. As we wrapped up, she asked about my favorite things to cook. I never have a consistent answer for this - my favorite food is whatever I happen to be obsessed with that week - but my favorite method of cooking is braising. We both agreed that slow cooked dishes are an exercise in patience. The more I think about it, they’re also an exercise in trust and faith. Cooking in my Dutch oven has been meditative. It requires me to put the lid on and leave food alone, knowing that if I put everything into the pot that needed to be there, the rest is up to time and heat alone. I forget that lesson in my own life sometimes. Prematurely stressing over my progress (or lack thereof) is akin to poking and prodding at a tough piece of pot roast that hasn’t yet transformed into something more tender. It doesn’t mean that the recipe has failed, or that the ingredients were wrong. But once the meat is flipped over and the sauce stirred, after some carrots and potatoes are thrown in for good measure, that pot needs to be covered and put back into the oven until it’s really done. In my own life, I could stand to be a little more gentle with myself and allow this process to unfold. I had to remind myself that when things feel impossible, I’m often on the verge of a breakthrough. I prayed for it to come. When not cooking, I used my downtime to review old recipe notes and food photography albums. It was a cathartic process to clean out the virtual closets and revisit memorable moments. I went back through the archives pulling out recipes I’d forgotten or that didn’t fit into previous projects. Turns out, I had more than enough content for a cookbook. (Two books in fact, as I later decided to split half of this collection into a separate volume.) More than that, as I worked my way through my files, I realized how much the quality of my content had improved with time. There was no denying how hard I’d been working all of these years to get here. For six years, my social media presence and digital cookbooks have served as an open invitation to my kitchen. Whatever I was cooking that day was likely to be shared via photos and often, live video. As my audience, you’ve virtually tagged along for grocery trips and visits to the butcher, seen the meals I prepped in clients’ kitchens and what I make for my own family’s Sunday dinner. 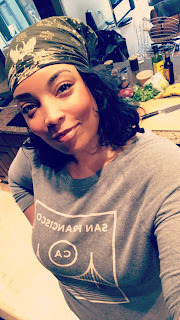 As I worked to improve my kitchen game, my followers and blog readers have grown into better cooks right along with me. 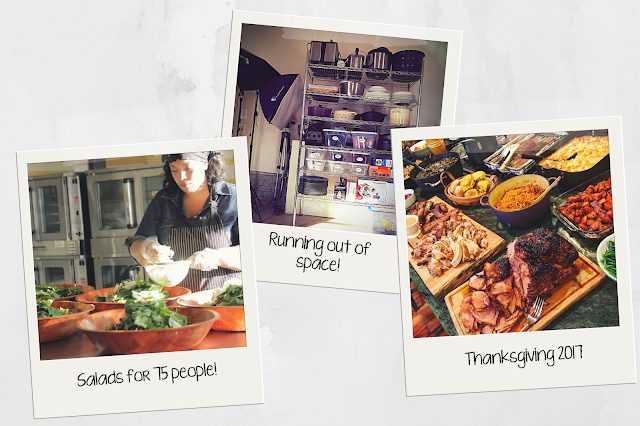 Since publishing my digital cookbooks, I’ve been tagged to photos of everything from swagged out Super Bowl spreads to families actually enjoying the Thanksgiving turkey for the first time. Nearly every weekend for the past year, the #KitchenistaSundays hashtag has brought us together to salivate over each other’s comfort food. It’s incredibly touching to hear from women who have shared that cooking also became their form of self-care, or that they had lost an interest but now use my books for Sunday dinners. In the fall, our tribe showed up offline too. When I had the opportunity to staff my public dinner events in DC, I was thrilled to be able to hire Taulora and Louisa from my social media network, along with other black-women-owned small businesses as vendors. For better or worse, I’ve shared big parts of my personal life too. In 2014, devastated by unexpected job loss and facing single motherhood for the second time, I found support in surprising ways online. My daughter was lovingly nicknamed “Biscuit” on Twitter during my pregnancy, a nod to the well-documented fertility powers of my buttermilk biscuit recipe. Women I’d never met in person rallied around me as I live tweeted through an unmedicated labor. When Raven arrived, she was immediately met with virtual love and adoration that still hasn’t wavered, four years later. My followers have watched in amusement as she stole food from my plates over the years and grew up before our eyes into the sassy toddler-sized sous chef she is today. Over time, these acts of kindness added up. They helped me find the silver linings of my circumstances, and learn how to be more kind to others in turn. 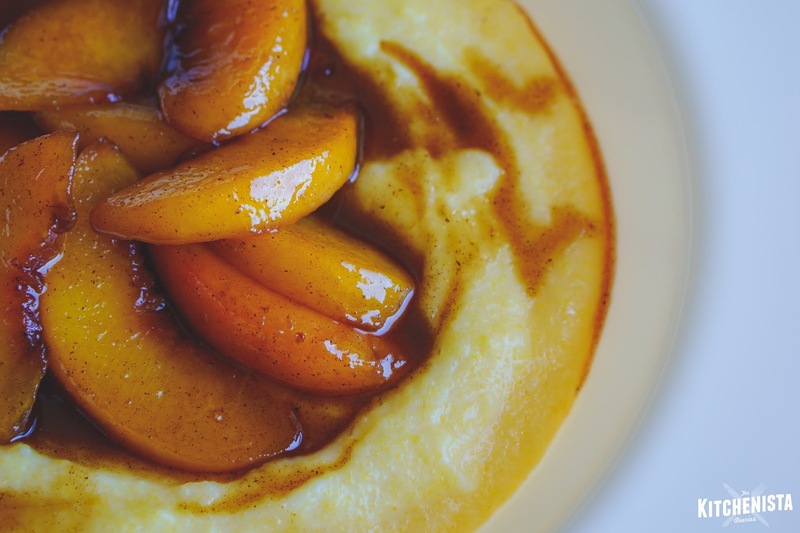 It’s been quite a ride, and today I’m proud to stand before an army of enthusiastic home cooks who get excited for anything roasted in duck fat, but still enjoy rigorously debating whether sugar belongs in grits. (My final answer may surprise you.) All of this serves to remind me that my platform is communal, and has become about your journeys as much as it is about mine. This movement can and will become so much bigger with your energy and continued support. As for me, my journey as The Kitchenista is far from over, but right now I’m working on being happy as Angela. It’s time to move on from some things that aren’t going to take me to the next level and figure out what will. In much the same way that I worked tirelessly to set my kitchen up for successful cooking, I have to set myself up for success in my personal and business life. This means making changes to everything from my daily work habits, to how much sleep I get at night and the boundaries I set online. I’m learning to trust my instincts and walk away from people who don’t have my best interests at heart. I’m working on making smarter decisions with my time and money, and willing to invest in more reliable technology so that I can work effectively. Most importantly, I have to take care of my mental health, because the alternative means everything else is in vain. I understand the transformative power that lies in learning how to cook for yourself. I suppose that’s why I’m so passionate about encouraging others to reclaim their own time in the kitchen, beyond the benefits of eating better and the technical, tangible aspects of improving a skill set. Food is the reason most of you will open this book, but for those seeking more than that, for those who have no choice but to lift themselves up, the gift I’d like to leave you with is the recipe for self-healing. 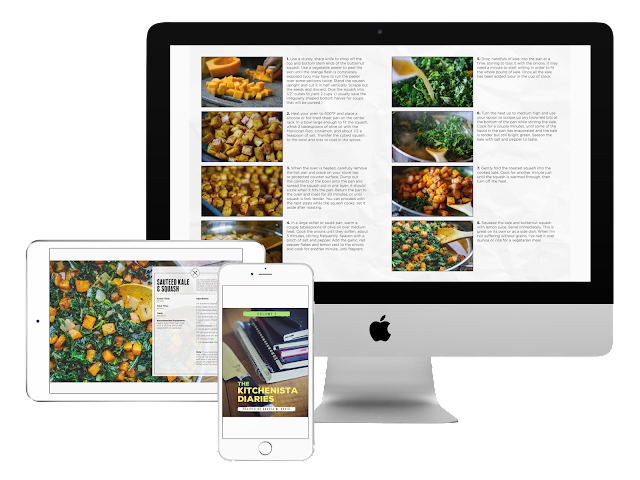 All of my digital cookbooks are sent in PDF format and compatible with any desktop or mobile device. The books can be purchased at e-junkie.com/thekitchenista using PayPal or a credit card. Save when you purchase all 3 currently available titles at the discounted bundle rate of $15!